Bibliophilia, Please: #TheHobbit The Battle of The Five Armies Digital #Giveaway! #TheHobbit The Battle of The Five Armies Digital #Giveaway! The final installment of The Hobbit is here! 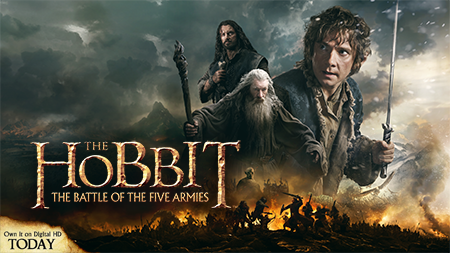 Warner Bros. is proud to bring you the Digital release of The Hobbit: The Battle of The Five Armies! Mouse over the Interactive map of Middle-Earth and take the quiz to find out what is your Middle-Earth weapon of choice! From Academy Award-winning filmmaker Peter Jackson comes The Hobbit: The Battle of the Five Armies" the third in a trilogy of films adapting the enduringly popular masterpiece The Hobbit, by J.R.R. Tolkien. The Hobbit: The Battle of the Five Armies brings to an epic conclusion the adventures of Bilbo Baggins, Thorin Oakenshield and the Company of Dwarves. Having reclaimed their homeland from the Dragon Smaug, the Company has unwittingly unleashed a deadly force into the world. One (1) Digital Download Coupon for The Hobbit: Battle of the Five Armies will be awarded to a lucky winner here on my blog. So, check out the blog app above and be sure to enter to win on the Rafflecopter form below! Open to addresses in the US ONLY. The prize will be sent via FedEx or UPS - No P.O. Boxes! FTC DISCLOSURE: Bibliophilia, Please is working with Warner Home Video in order to provide this giveaway to its readers. All materials have been provided through Warner Home Video. No money or favors have been exchanged for this post. I got Bilbo's short sword Sting! It's pretty accurate; like a hobbit, I enjoy many breakfasts, going barefoot, and (mostly) staying at home! Somewhat appropriately, I enjoyed learning about The Shire on the map. I love the round doors on the hobbit holes - they look so cozy! apparently I'm also Bilbo :) I did like the map. I forgot about some of the locations since I haven't read the book in a long time nor seen the movie. I liked that with all of the sophisticated names there was Lake Town. Thanks for sharing! I got TAURIEL’S bow and arrow! I like the fact about Rivendell. Rivendell sounds cool! There's the elvish outpost there! I wield the bow and arrow. YOU WIELD TAURIEL’S BOW AND ARROW!